This was written in August of 2004, about a year after the Conquests expansion for Civ3 was released. It was a summary of a number of different problems and complaints I had with the final version of the expansion, issues that I had believed would be solved through patching after the game released. When it became clear that some of these problems would never be adequately addressed, I felt compelled to write up a short editorial on the subject. This is not to say that Conquests is a bad expansion pack, or even that I don't like it (I have somewhat mixed feelings about it), only that the game balance of Civ3 was on the whole negatively affected by the Conquests expansion. Like a lot of other Civ3 enthusiasts, I had high expectations for Civ3 Conquests. Unlike most players, this was not based on idle speculation but rather stemmed from a great deal of time spent testing Conquests while it was still in development. Now that a year has passed since the second expansion was released, I have to say that I am disappointed with the way that Conquests ultimately turned out. The release of Conquests briefly generated a renewal of interest in Civilization 3 among many different players, but within six months most of that had died away. Participation in the Realms Beyond Epics, what I consider to be my "home" series of games, is at its lowest point ever. Now I understand that a lot of this is due simply to burnout on Civ3, as the game has been around for more than two and a half years at this point, and there is inarguably a sizeable community of players who are still going on strong. But I believe that if Conquests had truly improved the balance of the game instead of simply "adding more stuff", we would be seeing a larger share of old-timers hanging around it still. As such, what follows are ten places where Conquests, at least for my money, failed to deliver. In retrospect, I feel that the final release version of standard Civ3 (1.29f) actually offered the best overall game balance. 1) Lethal Bombardment: This change, without a doubt, was by far the worst thing that BreakAway Games did to Civ3. The stand-alone game offered a great balance between artillery and regular units, with artillery being able to damage other units but unable to defend themselves. Most importantly though, they could NEVER kill other units; the only unit which could was the pricey, one-time use cruise missile. Regular units were the only ones which could actually kill units or capture other artillery pieces, so it was necessary to use a combination of both to achieve best results. Intelligent use of combined arms like this added a great deal of strategy to Civ3, and helped elevate it quite a bit beyond its two predecessors (where catapults were 6/1/1, for example). Bombardment on ships and planes worked the same way, and intelligent players fighting wars in the Modern Age would frequently use both. Bombers, for example, could hit targets much further away than artillery but had the weakness of being shot down or having the city they were based in captured. Battleships could defend themselves against attack without need of a protecting unit, but could only hit targets along the coastline. Bombardment in standard Civ3 was thus able to offer a very large advantage to the player, but the fact that units still had to expose themselves to attack in order to finish off another unit for good kept bombardment units from running away in strength and the player from exploiting his/her edge in artillery to ridiculous degrees. Any such balance has been thrown out the window in Conquests. Finally, another issue that needs to be dealt with is lethal bombardment for airplanes. It's just excessive and extremely overpowering in the hands of a human player against an inhuman AI. When the Aztecs sneak-attacked me, I had just built my first bomber that very turn and had no air force to speak of. 10 turns later, even with just a dozen bombers I was able to redline and then KILL every defender in an Aztec city, which my cavalry then proceeded to walk into untouched. What could I have done with 20 bombers - or 50? I could have killed all the defenders in every city and let my units walk into them one by one without ever fighting a battle. Combining non-lethal artillery with lethal bombers is even worse, which I was able to do routinely as well. I don't even want to THINK about what radar artillery plus stealth bombers could do. Suggested Fix: No planes should have lethal land bombardment. Sea bombardment yes, but never land bombardment. This was what I said when I first read the desciption of that change, and my testing has only proven it out. Lethal land bombardment of any kind is simply too overpowering for any units to have it. Maybe that makes you unhappy - deal with it, it IS too powerful. The fact that the range for air units has been greatly increased already massively increases their power. Adding lethal land bombardment on top is way, WAY too much. But despite massive evidence to the contrary, BreakAway either didn't notice/didn't care that lethal bombardment would destroy the combat model of Civ3. I should have taken a bigger stand against the issue, but... there were so many changes being made in Conquests that I couldn't promote every cause I wanted to. The same people at BreakAway wanted to change the requirement for a single-city cultural victory to 10k culture instead of 20k. The reason? "No one ever wins that way, so let's make it easier." I literally spent a week writing page after page of text explaining why that was a BAD idea. The first 3 builds of Conquests had 10k culture as the single-city limit, allowing ridiculous stuff like 1400AD cultural wins. Ultimately I helped get that out of the game, but I didn't win all the battles I wanted, and this was the unfortunate result. As a result, I have no desire to play Conquests after the start of the Industrial Age anymore. I've played around with some of the scenarios, recently playing the "New Alliances" intro conquest and winning it on Deity, but the actual game after the Industrial Age I don't want anything to do with. Look, we already know that Civ3 breaks down when humans get access to rails and factories, right? And we also know that the AI can never possibly use bombardment units as well as an intelligent, thinking human can do. So what does BreakAway do in the expansion? They add MORE human advantages in the Industrial Age and make bombardment even MORE powerful for humans! Oh, THAT will help the game balance, I'm sure. 2) Airplane Range: This wouldn't be all that big of a deal on its own, but when the addition of lethal bombardment is factored in, it means that air power is ridiculously overpowered now. The sad thing is that it was never underpowered back in standard Civ3, it only required some intelligence on how to use it. Now we get bombers that can hit units 10 tiles away, bombarding as strong as artillery (12) at getting 3 shots instead of 2. And they can kill units. If you've seen stealth bombers (18/0/3, range 16), it's even worse. The sad thing is that if you can build a certain amount of bombers in Conquests, you're essentially invincible to attack. Where's the strategy or game balance in that? At least with artillery you still needed to KILL the unit after you knocked it down to 1hp. 3) New Bombardment Rules: Forget to mention this one above. This is actually a corollary to the above problems, but starting in Conquests the bombardment units always hit units first in cities, never improvements or population. Always units. Since in prior versions of Civ3 bombarding cities had only a 1/3 chance to hit units, this means that bombardment essentially becomes 3 times more likely to hit units in Conquests. This again provides a massive advantage to the human player when assailing cities, even before we consider lethal bombardment. This aspect of Conquests is totally broken, making artillery much stronger than before, and giving bombers almost godlike control over the battlefield. The old rules were irritating at times, but at least kept things in balance. 4) Leaders: This category is really sad, because I thought that Conquests was going to finally solve the problem we had with random military leaders spawning and rushing wonders out of nowhere. Conquests actually DOES fix military leaders, allowing them to either form an army or rush a non-wonder city improvement. This was what I initially thought we were going to get with Conquests, a fix to the problem of military leaders randomly popping up and then rushing wonders. Instead, we got scientific leaders randomly popping up and then rushing wonders. I honestly have no clue what the scientific leaders are doing in Conquests. How in the world do they fit into the game? Well OK, I understand that they represent a scientific breakthrough, but how do you quantify that into game terms? It sounds like a bunch of execs were sitting around in a meeting pitching ideas to one another, and someone said "Hey, what if you could have scientific leaders too!" and everyone nodded their heads and thought it would be a great idea. Then the game designers were told to put it into the game - "Create a unit that represents innovation". Uh... yeah. How do you do that? I don't think you can, at least in terms of Civ3. The solution that BreakAway came up with for Conquests can only be described as appallingly bad. Whenever a civ discovers a tech for the first time, there is a 2-5% chance that a leader forms, who - oh, by the way - can instantly rush any wonder in the game. Game balance problems? Why would you ever think that this concept could unbalance a game? It's also sad that this problem was demonstrated in testing as well, and still allowed to be left in Conquests. I didn't encounter it very much because I was playing on Demigod or Deity most of the time and was predictably not discovering techs first - to put it mildly. The people who really found this problem were the ones playing competitive multiplayer games. It turns out that having one of the two players suddenly get a free Pyramids completely out of nowhere on turn 10 of the game can unbalance it just a wee bit. Within a few days, the multiplayer folks were pressing for a switch to turn off scientific leaders in their games (I can't remember if they got it or not, since I don't have any experience with multiplayer myself). So despite strong evidence that scientific leaders were really screwing with the game balance, BreakAway left them in the game, no doubt as a selling point to move more copies of the expansion. They are one "addition" that the game would be much better off missing. 5) Armies: While military leaders themselves have been fixed, the armies that they create were broken in Conquests. Before Conquests, you would have been crazy to use your first leader for an army in the vast majority of situations. Now, you have to be crazy not to use your first military leader for an army to get access to the Heroic Epic and the Miltary Academy - and thus, more armies. In short, they are simply TOO powerful in Conquests, with their +1 movement, auto-pillaging, and rapid healing. Anyone one of these would have been a good addition to armies to get players to use them more. Adding all three turned out to be massive overkill. I point specifically to the succession game RBC8 - Revenge of the North Koreans as a good example, in which armies were virtually the ONLY offensive units of the entire civ for centuries and allowed much more aggressive play than what otherwise would have been possible. (That game also showed why lethal-bombarding hwat'chas are disastrously overpowered, which I specifically said would happen when they made that change in testing, but I digress). I was also reading about an Always War game recently in which multiple horseman armies were able to hold off massive invasions and keep a civ without iron and far behind in tech afloat on Emperor. Thinking back to my own Always War games, if I had been able to build these kind of armies, I would have steamrolled the AI in Epic 27. AI armies are just as powerful as human ones though, so where's the problem? It stems from two places. First, the AI is programmed not to attack units that it does not have a significant chance to defeat. Since it evaluates everything on a unit-by-unit basis, it does not understand that it could kill an army by pooling its attacks with multiple units. Therefore, a human army can frequently walk around with almost complete impunity deep within AI territory, using its auto-pillage ability to disconnect resources and wreck havoc. This is not something that the AI would ever be able to do against a human. Secondly, the AI does not understand how to build competent armies or use them effectively. Anyone who has ever seen one of those longbow/pike/swordsman AI armies knows what I am talking about. Humans can always use armies more intelligently and get more use from them. This was the case in standard Civ3 as well, but it didn't matter as much since armies were in balance with the rest of the units. In Conquests it is possible for a handful of armies to kill scores of AI units; in other words, the AI is bleeding shields out of its ears while the human is losing zero units due to the huge hp totals of its armies. THIS IS NOT STRATEGY. It's taking advantage of flaws within the AI to gain a huge edge for the human which should not exist. The new armies are fun to use, but they are too strong. If humans can win wars against superior opponents without having to make a sacrifice in units to do so, then we're approaching the advantages conferred by Civ2 zones of control, and that's not a good thing. 6) The Medieval Infantry: Although technically this was a change from the Play the World expansion, it can be considered here as well. PTW was essentially an alpha version of Conquests shipped out to the public to make money before it was even remotely ready, so I think it's fair to consider the (minimal) changes of PTW. The Medieval Infantry, or MDI for short, was probably the worst unit added to Civ3 in terms of balance. The standard version of Civ3 forced the player to make a classic strategic choice in the Ancient Age. On the one hand, you could pursue war with swordsmen, who at 3/2/1 possessed the highest attack and defensive stats of the age. Swords required iron though (the most valuable resource), and were slow-moving and could not retreat from battle if losing. Most importantly, swordsmen were a dead-end unit; no upgrading, ever. Any shields invested in them were only good for a relatively small window of opportunity. Horsemen, on the other hand, were fast and could retreat from battle if losing. They had much lower stats than swords though, at only 2/1/2, and cost the same 30 shields. Unlike swords, horses had the advantage of being upgradable to first knights and then cavalry, so they were the much better long term investment. Thus the choice: do you go with the superior defense and greater punch of the soon-to-be obsolete swordsman, or with the speed and upgradability of horsemen? These kind of choices are the meat of strategy games; take them away and chess turns into tick-tack-toe. The MDI destroyed this classic tradeoff. Now the swordsman WOULD upgrade, into a 4/2/1 unit enabled at Feudalism, meaning that shields put into swords would not be wasted at all. As soon as the next age started, BOOM - now your swords can upgrade to the same attack strength as knights and keep going. So much for having to make a strategic tradeoff. Even worse, the MDI completely invalidated the purpose of the longbow unit, which at 4/1/1 and the same cost now served no purpose unless the civ in question was unlucky enough to lack iron. And longbows come later on the tech tree than MDIs! You get the better unit at the same cost before the worse unit! Does that make any sense whatsoever? Then the problem was only made worse by allowing these units to upgrade further into the guerilla, although admittedly this was not a very good unit. Conquests compounds the issue further by allowing the guerilla to upgrade into the TOW Infantry. Now everything upgrades to something else - everything! This has affected the civilization unique units too. Babylon's Bowmen (2/2/1) for example are a great ancient age unit, but they were "horribly unupgradeable" in standard Civ3. This was by design, since you got ancient age punch but in exchange lost the ability to upgrade these units to anything useful. Bowmen now upgrade all the way to TOW Infantry. Again, Conquests is removing strategic elements from Civ3 by dumbing down the upgrades. The TOW Infantry is another poorly added unit, a resourceless unit which primarily makes it more difficult to mop up civs after the game is over. Employing resource denial late in the game to prevent the AI from building tanks or mechs is strategy. Simply giving everyone the option to build better resourceless units takes away from it. But the MDI was the unit that started this by upsetting the balance of ancient age units, the blame starts with it. Adding more "stuff" to a game does not necessarily make it better , and the MDI is a good example of that. So first of all the Statue of Zeus is problematic because of its resource requirement. Secondly, it is drastically underpriced at only 200 shields. This is cheaper than almost all of the Ancient Age wonders; it's cheaper than the freakin' Oracle, for goodness sakes! Knowing what it does, it should definitely cost at least 300, if not 400 shields. Third, it expires much, much too late with the discovery of Metallurgy. A player can research almost all of the way to the Industrial Age without discovering that tech; either Invention or something around Education would be a better bet. Finally, the Ancient Cavalry units it produces are simply too strong. 3/2/2 AND +1hp?! I mean, are you out of your mind? And you can build this thing upon discovering Mathematics? Each Ancient Cavalry is a Gallic Swordsman with an additional hit point; since Gallics were appropriately priced at 50 shields (and are way too cheap at only 40 shields), we can figure that the ancient cavalry is worth about 50-60 shields. We can reasonably expect the Statue of Zeus to last 100 turns before going obsolete (and that's probably a conservative estimate), and producing a free ancient cavalry every 5 turns that would get us 20 ancient cavalry. Hmm... 20 ancient cavalry at 50 shields each gives us... 1000 shields worth of units (!) for a wonder that costs only 200. The Pyramids and Sun Tzu's can match that in free buildings, but only on large pangea maps, and both require a much more significant investment of shields. To get the Pyramids, for example, you usually have to sacrifice or slow down your expansion. At half the cost, you can have a first ring city build the Statue of Zeus, and if you are the only one with ivory, you aren't even in a wonder race! I've seen Ancient Cavalry run over entire civs on smaller-sized maps without even breaking a sweat. Heaven help you if you get a leader and put these guys in an army. Random luck factors determining who gets a massively overpowered wonder which spawns an elite gallic swordsman every 5 turns? That's another "addition" to the game which I can do without. 8) Specialists: The new unit specialists and the improvement made to taxman and scientists do not on face appear to cause any problems with Civ3. On the contrary, I believed that they would become valuable additions to the game and improve its overall balance. A year after release, I can say that specialists do add a lot to the game - but they don't improve balance. Far from it. My basic complaint with the specialists is that the AI can never use them as effectively as the human can, not even close, and that this gives an intelligent human a subtle but huge edge in close games. Taxmen and scientists getting extra value doesn't really cause much of an issue. More significant is the addition of police officers and civil engineers, which the AI does not understand how to use and thus gets essentially no value out of. A couple policemen can drastically cut the corruption in cities away from the capital, allowing everything to be built faster. And civil engineers allow even hopelessly corrupt cities - if they have enough food - to produce anywhere from 10 to 20 shields per turn. This is not good if the AI doesn't understand how to do it too. See, Civ3 out of the box in the old 1.07f days used corruption as a limiting factor. All strategy games need some kind of a limiting factor, such as worsened diplomacy for larger civs (as in Master of Orion), to keep one empire from simply pulling away from the others and running with the game. In Civ3, the primary limiting factor is corruption, which keeps you from capturing an endless amount of productive cities. Corruption was too high in the initial release of Civ3, but it has gone down in virtually every patch and new version released since, to the point where it is now probably too low, if anything. Civil engineers allow you to bypass this limiting factor by over-irrigating hopelessly corrupt cities and turning that surplus food into a specialist that produces shields. There is a reason why standard Civ3 doesn't have a specialist that produces shields, for exactly this reason. In the right hands, it can be extremely powerful. I wouldn't have a problem with it, except that the AI does not understand how to do this and therefore it is a tool only to make the game easier for the human. And furthermore, where does the advantage come? In the Industrial Age, exactly where the human player is already getting the edge that comes from rails and factories! :weed: As it stands now, I think that specialists would need to be reworked in such a way that the AI could figure out how to use them better. Since that's not going to happen, I'd prefer the situation in standard Civ3 without them. 9) New Terrain: OK, does anyone LIKE volcanos and marsh? The volcano is neat the first time it errupts, but I seriously don't think that Civ3 needs another random event like it. If a volcano does errupt near your capital in the early game, it also can be a serious pain to clean up the pollution that results. Even if the volcano doesn't erupt, how much good is a tile that produces no food, no commerce, and cannot ever be mined or irrigated? They do produce shields, but the inability to improve them in any way is really a big drag. ALL tiles in standard Civ3 could be improved in some way; most could be mined or irrigated, jungle could be cut down, and even water could be made useful with harbors and offshore platforms. Volcanos are just useless, and I would be much happier without them at all. Marsh tiles are even worse. 1 food, no shields, no commerce is irritating enough - yeah, we need another terrain type like jungle - but the worst part is that you cannot settle on marsh. This is absolutely infuriating, and since it takes forever to chop down, a marsh start is significantly worse than a jungle start. In one of my test games I started surrounded by marsh and quit in disgust halfway through the ancient age as I had settlers standing around waiting for workers to spend 24 turns to clear a spot for them to plop down. This is not fun. Marsh doesn't even LOOK good graphically on the map, more like some diseased splotch of green and brown. Yuck. I would be much happier without the new terrain types at all. 10) Governments: Although Conquests adds two new governments, I can't say that either really "adds" much to the game. Feudalism doesn't seem to make any sense to me, since it is based upon the premise of having lots of small cities and then penalizing you as they get bigger. Excuse me, but isn't the baserock principle of all empire games to be as large as possible in population? Fedualism at best seems contradictory, at worst nothing less than a dreadful mistake. It is also very, very irritating that now the AI civs value this tech extremely highly and refuse to trade it for anything less than an arm and a leg. I could do without this government. Fascism, if possible, is worse. The government has penalties so drastic that it makes the AI "collapse to communism" of earlier versions of Civ3 seem like a picnic. The population hit that your civ takes upon switching to Fascism is just brutal. I think a human can cope with it, but I doubt that an AI could. The unit support is great, true, but the AI already gets massive unit support on higher difficulty levels. The pop drop, the whip rushing, and the inability to create culture due to xenophobia - all these features seem designed to make Fascism a government in which the AI will collapse upon entering. This may not always happen, but either Monarchy or the improved Communism would both be vastly superior choices to Fascism's penalties. I can't see why any player would ever want to swap to Fascism except in extreme circumstances. Any increase in worker speed you would get would more than be lost in the population drop that your cities would take. Blah to that. 11) Map Trading: Err, yes, I had an 11th issue with Conquests. I personally am not a fan of the new emphasis on exploring, which moved back contact and map trading well into the Middle Ages. Now I would agree that it was ridiculously unrealistic for civs to have a complete map of the world and all be in contact with one another by 1000BC. But at least for high-level games, this was really a good thing for game balance as it kept the AI civs rapidly progressing and aggressively settling all the land out there. When the AI civs do not have contact with one another, they fall behind and perform poorly, even on higher difficulties. 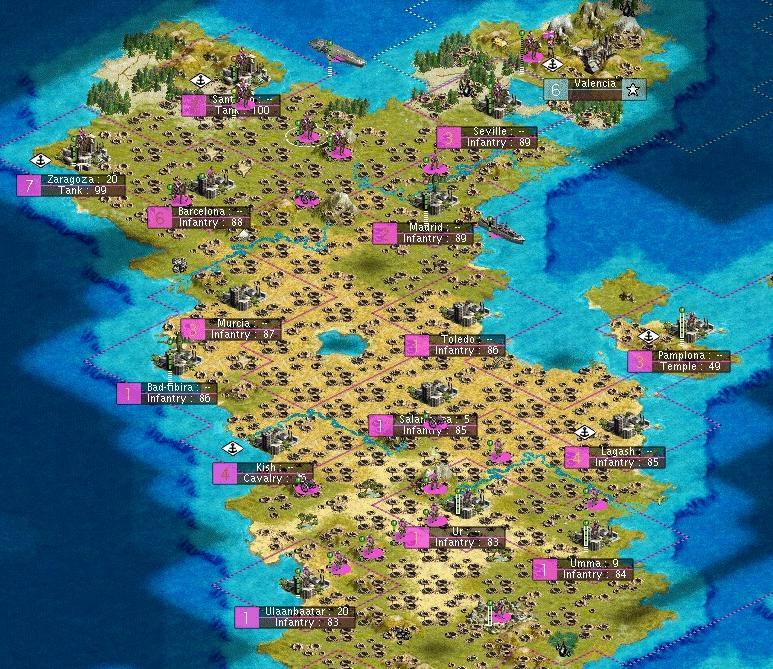 In Conquests, on archipelago maps in particular, the civs can be kept apart and trading keep the player in the tech lead for much, much longer now than used to be the case. This is because the AI stinks at exploration. Yes, they get a bazillion free units at the start of the game to play with, but how many times have we seen an AI civ fail to contact a civ across two tiles of water right next to their starting position? The AI isn't good at exploration and the player is, so pushing back contact trading will always reward the player if he/she make a decent investment in exploration. I should tell you that all of the "Sid" wins in testing (and there were a couple), were based upon creating archipelago maps (to negate the Sid expansion bonuses) and keeping the AI civs separate for most of the Ancient and Middle Ages to broker techs. I didn't like this strat of play and am sad to see that it can still exist. I LIKE the world to get into contact with one another right away, because that's when the game really starts to begin! And, although it's a personal issue, I don't like playing large stretches of the game with a dark map. I like to see where everyone is ASAP. The changes to map trading and communications trading don't mess up the game all that much, but I have never liked them myself and will use this as an opportunity to sound off against them, so nyah nyah. There you have it, 10 (11) things that I believe Conquests got wrong. That's not to say I don't like large aspects of the game; far from it, Civ3 is still a lot of fun to play with some of the new stuff. But overall I feel as though a lot of new things were crammed into the expansion with little to no thought over how they would upset the delicate game balance of standard Civ3 which took a full year of patches to achieve. Expansion packs are driven by a desire to sell the product and make a profit, so I guess I can't blame Firaxis and Atari for trying to achieve financial success. In summary, I believe that 1.29f is still the most balanced version of Civ3. Agree or disagree as you will, but those are my reflections after the last 30 months.